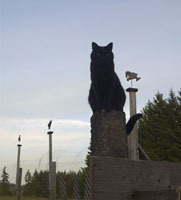 Our view at Friendly Haven Our black cat Otie sits atop the garden fence post at dusk looking much like the gargoyles on the other posts. Every evening around dusk two does come down from the forest to eat the leftover apples from our orchard. A doe with her twin fawns comes first and another aunty doe follows. I was sitting up on top of the ladder in our garden with our ginger kitty, Remy, in my lap. That's our evening ritual, watching the day go to dusk together. All fall I would pick a handful of fresh peapods to eat up top while Remy purred and purred, but now that we�re into the rainy winter here, I chew on a stalk of parsley or maybe a wintering-over carrot or two. Remy and I watch from the top of the ladder at the top of the hill where we can see in all directions. So quiet. Remy likes being able to see everything in his domain at once and I love the coppery light that spreads over the field. The doe slowly walked across the field with her two babies nosing along behind her. The larger fawn was first and the smaller fawn following. The fawns are about nine months old now, nearly yearlings, but every once in awhile I hear them make a little baby deer bleat. So sweet. The doe meantime headed straight toward our striped tabby, Danny, crouched in a clump of grass in mouse-catching mode. When she was just a few feet from him, Danny suddenly saw her, nose-down, walking straight for him. Deer are incredibly curious and she walked right up to Danny as he slowly, carefully tried doing a low-to-the-ground, turning, slinky slither so he could move away unseen. She marched determinedly toward him and he kept looking back at her as she nosed along toward him, just five feet behind following at the same pace. Every ten seconds he did a �meow of slight concern� and finally, realizing she was still coming, he turned to face her, laying flat in the grass, trying to look ever so small, hoping maybe she'd just pass right by. Instead the doe nosed right up to where he lay. This was a tad too intimate for Dan and he suddenly sprung off into the tall grass in the field. 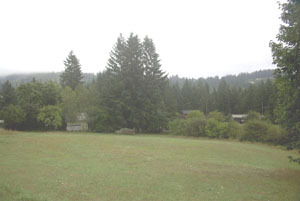 By then the doe's two fawns had caught up to her and they marched single file together off toward the orchard. The sun finished setting. The deer silently munched apples across the field. Remy purred. Quiet life. Every minute so rich.